fantasy artwork, illustration, design, graphics, pictures, modelling photos, photography and more.. Welcome to Hannah's underwater world where you can view stunning photos, art and quicktime footage of her adventures. Hannah is a professional Fashion & Beauty photographer whose own modelling experience has inspired her to create a more personal, artistic and affordable approach for those entering the modelling industry. Hannah has created portfolios and composite cards which have launched successful models. She works together with modelling agencies along the East Coast of Australia to get fresh new faces into the industry. Also, professional models often need to update their portfolios to show a current look. Because Hannah does Make-up, Hair and Styling, costs are significantly lower. Hannah also shoots fashion/beauty and jewellery for business catalogues. You will need a Flash 5 Player to view this website. Flying Colours Creations produces amazing artworks ranging from fairies to cyber computer graphics which are available in a variety of products ranging from greeting cards and posters to stickers and transfers, as well as graphic design services for book illustrations, package designs, labels, murals, prints, business cards, logos, flyers, wall hangings, CD covers and much more. 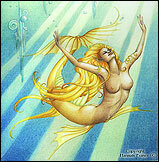 Hannah's magical artworks contain the enchantment of mythical ages, the beauty of nature, and the visionary insight into the new age of spirituality... Come on in and share her magic! You will need a Flash 5 Player to view this website. Hannah Fraser is a professional model who has worked for a wide range of clients in different countries. She is a positive and outgoing personality who shines in all mediums. She has worked in TV, photographic, catalogues, documentaries, movies, catwalk, performance and artistic projects.